[Portland, OR – January 24, 2019] — Local cat shelter Cat Adoption Team (CAT) is hosting an apprenticeship program to teach its nationally recognized kitten foster model to 21 animal shelters from across the country. The program is made possible thanks to a $60,000 grant from Maddie’s Fund®, a national family foundation established by Dave and Cheryl Duffield to revolutionize the status and well-being of companion animals. This grant will cover the cost of hosting the training and provide stipends to attendees. pre-adoption process to increase lifesaving for kittens under 8 weeks of age. 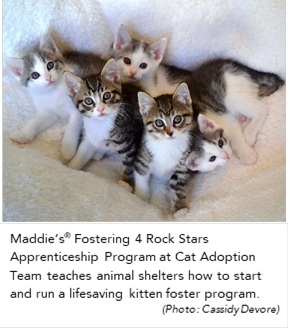 “Thanks to Maddie, this training pulls together years of CAT’s learning into ready-made materials, tips, and tricks so that attendees leave prepared to save lives immediately,” says Kristi Brooks, director of operations at CAT and the lead trainer of Fostering 4 Rock Stars. The first of three, four-day apprenticeship sessions begins at CAT on January 28. Local organizations—including Oregon Humane Society and Willamette Humane Society—plan to attend, alongside groups from as far away as Florida and Pennsylvania. By the end of the last session, CAT will have trained staff members from 21 shelters, representing 14 states. This isn’t the first time CAT has taught its foster program model to others. With prior support from Maddie’s Fund, three shelters participated in Fostering 4 Rock Stars training at CAT in 2017. In 2012 and 2013, Brooks took the training to 10 animal organizations throughout the United States. “It’s an honor to be recognized for our work and to help save kittens all over the country,” Brooks says. CAT started its kitten foster program 15 years ago in response to an overwhelming number of neonatal kittens entering shelters in the Portland metro area. Since then, the program has saved thousands of lives. In 2018, CAT fostered over 900 kittens, providing them with necessary care before helping them find loving adoptive homes. As spring approaches, CAT welcomes new foster volunteers to open their homes to kittens. If you are not able to foster, consider making a donation to help support the kitten foster program and to provide care for all of the cats and kittens at CAT. You can send your donation by mail to: Cat Adoption Team, 14175 SW Galbreath Drive, Sherwood, OR 97140. For more information about CAT’s programs and to see cats and kittens available for adoption, visit catadoptionteam.org. Cat Adoption Team (CAT) is the Pacific Northwest’s largest nonprofit, feline-only shelter committed to finding a home for every cat it takes in. CAT’s mission is to save the lives of homeless cats and to work with our community to provide feline expertise and quality programs and services for people and cats. CAT has found homes for more than 47,000 cats and kittens since opening in May 1998. As a 501(c)(3) publicly supported charity, CAT relies on the generous support of individuals and organizations. For more information, visit catadoptionteam.org. Find us on Facebook (facebook.com/catadoptionteam), Instagram (@catadoptpdx), and Twitter (@catadopt). Maddie’s Fund® is a family foundation created in 1994 by Workday co-founder Dave Duffield and his wife, Cheryl, who endowed the Foundation with more than $300 million. Since then, the Foundation has awarded more than $225.7 million in grants toward increased community lifesaving, shelter medicine education and pet adoptions and foster care across the U.S. The Duffields named Maddie’s Fund after their Miniature Schnauzer, Maddie, who made them laugh and gave them great joy. Maddie was with Dave and Cheryl for ten years and continues to inspire them today.